"...The creative team includes set designer Stephanie Kerley Schwartz, lighting designer Rose Malone, sound designer Christopher Moscatiello and costume designer Denise Blasor, all of whom contribute to the dark, wet and dreary atmosphere of the rundown barn in which the revival meetings take place, as well as many other locations to which the trio has traveled." "...Director Ron Sossi does sensitive, imaginative work here, but Faith Healer asks a lot of the audience. It employs the kind of Irish storytelling that thrives on repetition and the poetic rhythm of language. Without enough emotional energy, it can sink into itself. The show’s long monologues offer no direct interplay between characters, and the flow of so many words can have a hypnotizing effect. Regrettably, on the night I went, several people in the audience fell asleep. Others stood and cheered at the end." "...Faith Healer is a dark, brooding play, but it is also shot through with flashes of Gaelic poetry and humor. Teddy's speech on the mental shortcomings of actors is undoubtedly the high point of the show." "...The acting is excellent. We spend the first act with Mr. Norwood and Ms Cignoni, who fill it with recollections, regrets, and recriminations in an understatedly dramatic but thoroughly realistic manner. The second act opens with a jolt of energy as Mr. Bottitta, downing a bottle of beer during his monologue, combines the timing of a stand-up comedian with the (again) thoroughly realistic emotions of a man who’s essentially wasted his life." "...Grace's story is so piteously painful, Teddy's so funny but heartbreaking, and Frank, compels attention quietly , making it curious to understand how the other two could have been so doggedly loyal to a figure who doesn't appear charismatic at all. In fact, he's a self-doubter whose mind plagues him." 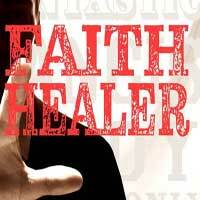 "...Faith Healer follows the Irish trope of exile and homecoming. It is, at its core, a study in one man crucified by a talent that betrays him so often. He has the intuition to stay out of his native Ireland, until one day, he returns home. And this is the play’s culminating story, on which its ultimate view relies." "...Brilliantly directed by Ron Sossi, Faith Healer is a powerful, absorbing drama of the highest caliber served up by an ideal cast. The show is produced simply with an unpretentious set by Stephanie Kerley Schwartz, spot-on lighting by Rose Malone, a sound design by the always-excellent Christopher Moscatiello, and perfect costumes by Denise Blasor." "...Faith Healer is a masterpiece of theatrical trompe l'oeil, a landmark in the rich Irish canon, but without really accomplished actors it would be an intolerable bore. Fortunately, we have a cast that can hold their own against the formidable odds that Friel has placed before them. The playwright almost dares the actors (and the director) to make this work."